With all the back to school shopping for the kids it's easy to forget ourselves in the midst of chaos. Today we want to celebrate you! And what better way then a Kayce Hughes giveaway? It's modern femininity at it's best. From their tops to their dresses the clothes are easy to wear with a giving fit, not to mention stylish and practical. While browsing don't miss out on their amazing sale section, there's plenty I need from there as well. For once your kids won't be the only ones starting the school year off in style. The color alone is enough to make me want to wear this dress just about everywhere, but add the details (the ruffling and tie) and I'm completely sold. You'll be surprised how good it looks on just about anyone! Our giveaway wouldn't be complete without a little something for those little ones we love most. This red ruffle dress is on the top of my holiday dress list. I can picture the girls now and it gets my heart beating just a little bit faster. You don't have a daughter? No problem, I'm sure there's plenty of darling girls out there you'd love to spoil. What is your favorite Kayce Hughes style? Lexi M. here. I am loving the ruffled shirt and wrap skirt combo. Lovely! I could use a fashion pick-me-up! Thanks! What a delightful store! Thanks for introducing me to Kayce Hughes. I adore the pink gingham ruffled shirt. As for dresses, the tan ruffled shirt dress is to die for! Thanks for the giveaway. Thanks for introducing me to a new clothing line. I am sure my husband and pocketbook will love it. I especially like her women's tunic dresses and the children's andrea dresses. the sophie jumper for little girls, and the ruffle shirt for women are probably my favorites. what great styles! I love the tunics! Or the ruffle dress....I love them all! that dress is so cute! i also like the wrap skirt. thanks! The ruffle dresses would look great with my inverted bob!!! I having having a baby in 3 weeks and need some new clothes to celebrate not being pregnant!!! i HAVE NEVER HEARD OF KAYCE HUGHES BUT WILL DEFINATLY BE A SHOPPER THERE. I LOVE THE RUFFLE DRESSES, AND THE PINK GINGHAM SHIRTS. Aw, what cute dresses. They do look like they'd be cute on anyone. The tunics are gorgeous, and I love the children's party dresses! They are all simple and beautiful--but I love the ruffle dress. oh wow I think they are all neat....the ruffle dress for me! I love her tunic dresses. I think those would be perfect for hiding my less-than-perfect postbaby body. I love the andrea dresses for girls. so sweet! I LOVE that ruffle dress!! I definitely need to get one, and my daughter does too! oh my, those two ruffle dresses you featured on your post are definitely the ones i would choose. such timeless classics! thank you for the exciting giveaway! i love the tunic dress in gree, too! i'm a dress kind of gal and kayce hughes has such stylish ones! the little girl's andrea dress is adorable! Oh my goodness! I la la LOVE the ruffle dress, how posh. Please, please pick me :) Thanks for the giveaway. Love the ruffle dresses for both me and my little girl. I'd love to have a great look like these. They ruffle shirt and wrap dress are a perfect fit. Love the style. The green tunic dress is awesome! I love anything green, and this I would even wear over a swimsuit to be extra stylin'. Thanks!!! I love the wrap dresses-great for covering up a little extra flab! :) Thanks so much for this giveaway! I love the ruffled dresses. So gorgeous! Beautiful dresses! Anything with ruffles is on my list! Love, Love, Love the dresses!!!! I would love the ANDREA dress for my little lady due this November. I love the ruffled dress!! It would look so cute on my little girl. LOVE love the ruffle shirt dress. Such cute style! Thanks, Tara B.
i love all of the ruffle shirts (especially the white one) because it is a romantic and feminine twist on a classic piece of clothing that is sure to never go out of style. that shirt is completely versatile and easy to match up with most already existing bottoms in the closet - perfect way to spruce up the wardrobe! oooh the ruffles are awesome! i would love to win! love the dresses! if only i could be the lucky girl to win them! I'm new to your blog and to these clothes and love them both! The women's Ruffle dresses and shirts are great, and I love the Andrea dress and the green Melodie dress (on sale) for girls. And the aprons... !!! Such cute stuff! Thanks for sharing! I love the wrap skirt! The Ruffle Shirt Dress is my fave. I can't get enough of ruffles lately! Would I love to win...ummm, that's a rhetorical question right! thank you for introducing me to kayce hughes...i love the simplicity of the designs. the wrap skirt, tunic, the sarah dress...i have had such a hard time finding clothes for my post-pregnancy body. i just can't seem to find the right style anymore. these are beautiful and make me feel pretty just looking at them. Yes, I'd love to win!!! 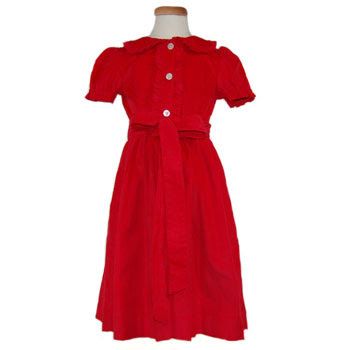 My favorites include the womens ruffle dress and shirt and childrens ruffle and party dresses. Lovely! I love the dresses! Sign me up. I love the Wrap Skirt. I want one in every color! Wow, love so many of the children's wear selections! The Catherine tops are adorable and love the wee Pea Coat too! There's some stylish girls out there wearing some great Kayce Hughes clothes, to be sure! I love the Wrap Dress in Red! Divine!!! i LOVE the ruffle dress!!!! The wrap skirt is also fantastic!!!! The ruffle dress in blue is my dream come true! So glad you pointed out this site - I like the short sleeved version too! I love the ruffle shirt dress style! Thanks! Love the ruffle shirt dress! I've been wanting that same beautiful blue ruffle shirt dress for my mother OR the white ruffled blouse ... love them both. i love the tunic dress and shirt. also the sara dress in the sale section is so cute! I'm so hoping for this - love her dresses! Pink gingham ruffled shirt is my fave. I love gingham and pink is my favorite color. Thanks so much for the opportunity. So excited! I have ADORED Kayce Hughes for awhile now. I LOVE the blue ruffle dress and all the tunics! The wrap skirt or the tunic top. How to choose just one?! I love the green little girl's Daisy dress and the stylin' women's red ruffle dress. I love the ruffle shirts with the wrap skirts! So cute. The question is, which style don't I love? I just had daughter number 5...no shortage of the need for stylish feminine attire around here! I love the ruffled dress in red.I love the fact that's corduroy. I can just imagine myself in it this winter. I love the Catherine Top for little girls - so cute. And for me, I adore the wrap skirts! That is way to hard of a question!! I think her tunic tops for women are great. Ahh I think, its to hard! Hmmm...I love the shirt dresses, they are so classy and comfy but I reeeeally love the cotton pj's. There's nothing better than a bath and great pair of pajamas! I like all the ruffles...shirts and dresses! MY fav is the blue ruffle shirt dress but I also like it in brown! I love the glorious blue ruffle dress too! They are all very darling though, I would be a very lucky gal! My favorite is the ruffle shirt with the swiss dot pattern! just love that ruffle shirt dress! thanks for the giveaway. Hi, I'm Emily K. What a beautiful line! I love the ruffled shirt, with the wrap skirt. All the colors are so neutral, and great. Thanks! i love the ruffled top. i could use a lovely dress for sundays. oooh! i love the ruffled shirt dress--would be perfect for work. i am keeping my fingers crossed on this one! Soo cute! Love the ruffle dress and the wrap skirt. They have them in such pretty colors. I've never heard of her before and I love the dresses - I think the little girl dresses are darling - especially the ruffled dress! I love the tunics for me and the ruffle dresses for my little girl, very classic designs- love that! I like the Andrea dress for the little ones. So cute. The ruffled shirt is really cute! I love the 'Daisy,'and 'Coco' dresses for little girls, they look like something the von Trapp children would have had in The Sound of Music. I love the ruffled dresses! But blue or brown? So lovely! Definitely the ruffle dresses and the wrap skirts. Too cute! I like the tunic dresses! Thanks for introducing me to Kayce Hughes... I may have to splurge on one of the dresses. I especially love the preppy pink wrap skirt and ruffled shirt! The matching preppy pink corduroy Sophie jumper would be adorable on my three-year-old daughter! I love the pink corduroy tunic, or all of the skirts!! So much fun!! My Favorite is the little girls Melodie dress. I also love the John Johns, and the Wrap skirts. I really love her stuff! What a fun store! Thanks for introducing me to Kayce Hughes. I love the pink gingham ruffled shirt. As for dresses, the tan ruffled shirt dress so so cute! Thanks for the giveaway. Darcie Sanders-love the ruffle dress! I love the ruffle shirt dress and the little girls dress is so sweet! I hope I win. I love the ruffled shirt dress in sea blue. Stunning. The ruffle shirt dress is too cute! Thanks so much! I love the tunics. And I love the red ruffle dress. It would be darling for a Miami Christmas. I really liked her vintage looking lunch box. What a great storage for ribbons and such. I love the ruffled dresses. so cute! I love the blue ruffle shirt dress too! I love the brown party dress. These are so timeless! Classic!! I am loving that blue ruffled dress! I have red hair, & it would look so chic. I want to win SOOOOOO BAD! It is hard to choose just one but I love the ruffle dress so perfect for spring, summer, or fall! 1) What is your favorite Kayce Hughes style? My favorite style is the bohemian girls, like the dress you are using in this post. Well, I think is like bohemian, but I like the classic style, and this beautiful dress in one of them. 2)Would you love to win? Yes, DEFINITELY!!! 3)enter one comment: Apart of the Giveaways, your blog is fantastic, I like the simple, but UNIQUE blogs. I love the ruffle shirt dresses. So classic and perfectly feminine! What a fabulous designer. I'm digging the ruffle shirt dress (its been on my I WANT list for a while now) and that little red dress is the perfect hue of red for the holidays! I absolutely love the ruffle dresses and the gingham shirts! and kids' wear is so cute as well! Oh How I love the dresses! Beautiful! Can't help but love the ruffle shirt dress and the wrap skirt. The tan and red colors would be great for fall. I like that ruffled shirt! Of course, that dress is very swanky too! Actually, it's just a charming shoppe all around. I saw that she has aprons too! Thanks so much for the review and giveaway. It's always great to find a new dress shoppe! Beautiful clothing, I love the ruffled shirt and the tunic dress! Can I just say that I would LOVE to win anything out of the selection! Pink Floral. Very cute stuff! They are all gorgeous, but I have to agree. The red ruffle dress is my favorite. These are so cute, I really love the childrens dresses! I really love the Olivia dress for little girls. All the dresses are beautiful though. I have never heard of her, but I LOVE the red ruffle dress for my little girl. I think thats my favorite. So stylish yet youthful. Thanks again for another great giveaway! Wow they are all cute. I love the wrap skirts. I may end up having to go buy one of those myself. The ruffle shirt dresses are really cute. For kids my absolute favorite is the Andrea dress. I love polka dots!!! Love the ruffle dresses! I would love to win! I love the andrea childrens dresses....so adorable. The ruffled dresses. So adorable. Well once I have baby number 2, I'm hoping I can squeeze myself into one of those ruffle dresses or wrap skirts. And baby will look darling in a sophie jumper. I love the brown ruffle dress! It's totally my style! the ruffles are definitely my favorite, and the red is so cute! it's so hard to find cute modest dresses, and this has cute detailing and can be worn with sandals or heels, i love it. I love the ruffled dress, it is both feminine yet functional! I also love her weekend shirts!! I like the palm green tunic dress...my daughter would flip if we won this. Adorable dress! I just found this blog via Kelly McCaleb's blog. Adding it to my google reader. Thanks for the chance to win. I love the wrap skirt and want them in more than just one color. So cute! Love the tunic dress and ruffle top. Thanks for the chance to win! Gorgeous! I think that very dress right there is my favorite! The tunic dress is absolutely lovely! My favorite! I hardly ever splurge on dresses so this would be such a treat! I love the red ruffle one myself. The sophie and catherine blouses would look so sweet on a little girl. Love the prints! My daughter would adore the Caroline dress :). The shirt dresses are absolutely adorable. It has a sophisticated look that I love! I love her little pillows for children and for women the ruffled shirts! I love this ruffle dress in camel, cause its timeless...but the blue is great for the season! I LOVE the white ruffle shirt. I need it. Oh what would I give for a dress. the tunic is the best, it'll help beat the Texas heat in style! i love the short sleeved ruffle dress. classy and comfortable. I would love to win a new fancy dress! How fun! I love the green tunic dress. It would hide my baby bump just perfectly! I love the ruffled dress, but the wrap skirt is so stinkin cute! I don't think my first comment showed up - so I am really sorry if I comment twice! Anyway, my name is Alicia and I love the ruffled red dress! I've never seen her line before this, but it is so cute! Thanks! I love, love, love the ruffled dresses! How beautiful! I love it all! The wrap skirts look really cute! I'd have to go with the tunics. They're beautiful! I love the ruffled dresses! Especially the one for little girls and the women's in red! Wowza great giveaway - I know my chances are slim but I thought I would give-it-a-go! I just adore ruffles! I personally love the ruffle dress. How can you not? I love the ruffled shirts and wrap skirts! The girl's ruffle dress is my favorite--so adorable! I'd love to have matching mom-daughter wrap skirts and hepburn shirts! So cute. ohmigosh! I *love* the tunic dress!!! :) and would love to win!! I love that red ruffle dress, def. a favorite! I also like the lulu dress, I could just see some gorgeous beach pics with that dress. I love LOVE the ruffles! i'm really liking the tunics. My faves are the daisy dress and the ruffle dress. They are all adorable, though. i reallllly need a new dress that wasn't purchased at least 6 years ago. yikes! i LOVE the ruffles, dress or shirt. i'm crossing my fingers for the win! Love the bold colors and especially love that ruffle dress! I have 2 daughters so if I win, I just may have to buy one more so we ALL match! So beautiful! All of it! The "coco" dress is darling. Those ruffled dresses are classy and beautiful. LOVE the ruffled shirt dresses and the wrap skirts! I love the pink corduroy tunic!